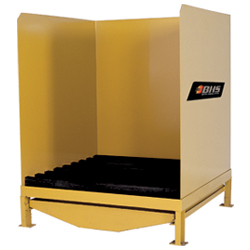 The BHS Hardwood Wash Station (HWS) provides a safe and convenient space to wash vertically extracted lift truck batteries. Contain overspray and add life to your forklift batteries by using this rugged battery maintenance equipment. The HWS has a recycled, polyethylene decking that is acid-resistant, non-conductive, and environmentally friendly. The 48-inch side panels keep wastewater confined to the station’s 23-gallon drain tray. The drain tray is removable for easy cleaning and has a 1-inch NPT coupling. Both the mild steel and stainless steel models offer fork pockets as an optional feature. These welded pockets make transporting wash stations a simple and quick process. The HWS is ideal for use with the BHS Recirculation/Neutralization Systems. Using the Hardwood Wash Station with one of these systems creates a closed loop for cleaning industrial batteries. This economical setup allows you to reuse wastewater and avoid disposal fees, which is good for budgets and the environment. Simplify the industrial battery washing process with an easy-to-use, heavy-duty wash station. Contact our sales team at +1 314 423 2075 to learn more about Battery Wash Equipment or to find a local dealer. Custom-built models are available to meet specifications.